Highly versatile, Dowler played quarterback in a single-wing offense in college and, while passing for 769 yards, he proved to be a proficient pass receiver with 41 receptions for 628 yards and 6 touchdowns and also handled the punting. The Packers chose him in the third round of the 1959 NFL draft with the intention of using him as an offensive end. Packers went 7-5 to tie for third in the NFL Western Conference in their first season under Head Coach Vince Lombardi, the team’s best record since 1945. 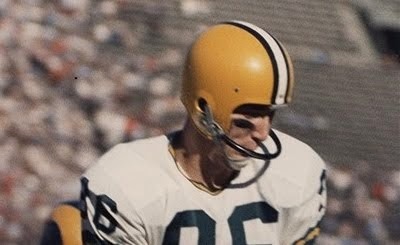 Dowler followed up his fine rookie season by catching 30 passes for 505 yards as the Packers won the Western Conference in 1960 for the first of three straight years. With good speed as well as size, he proved to be a dependable short receiver who was capable of breaking away for long gains as a flanker or split end, becoming a fixture in the offense for the remainder of the decade. His punting ability also came into play, beginning in ’60. Dowler gained a career-high 901 yards, on 53 catches, in 1963 and was selected to the Pro Bowl for the first time in ’65. His production dropped in an injury-filled 1966 season (which also knocked him out of the first Super Bowl), but Dowler bounced back with a career-best 54 catches, for 836 yards, in ’67 and again received Pro Bowl recognition. He played through 1969 before retiring to become an assistant coach under George Allen with the Rams and, following Allen to Washington, came out of retirement in 1971 when injuries depleted the receiving corps before quitting for good. Overall, Dowler caught 474 passes for 7270 yards (15.3 avg.) and 40 touchdowns (of that total, 448 catches, 6918 yards, and all of the TDs came with Green Bay). He also averaged 42.9 yards on 93 punts. He was chosen to the Pro Bowl twice.